Flowers "wave" at insects to get their attention, scientists have discovered. The finding helps explain why many flowers waft in the breeze, and reveals a hitherto unknown trick used to attract pollinators. 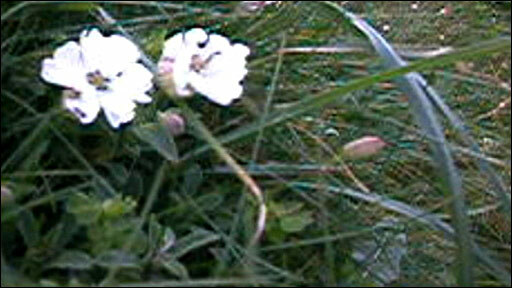 Scientists made the discovery while studying common wildflowers known as sea campion on the Welsh coast. Mobile flowers are visited more often by insects and also produce more seeds, they report in the Journal of Evolutionary Biology. 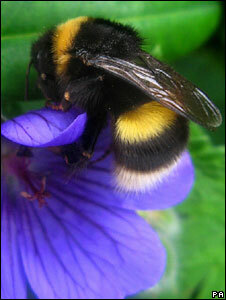 Moving flowers also attract a wider variety of insect species than more static blooms. For years, biologists have known that flowers use striking colours, fragrances, elaborately shaped petals and nectar to attract pollinating insects such as bees and flies. Yet no-one had ever seriously considered whether wafting in the wind acted as a similar signal. "I was lying on the beach watching flowers wave in the wind at my daughter's birthday party, and I wondered why they have stalks and risked getting damaged in such an exposed habitat," recounted John Warren from the University of Aberystwyth. So he looked at what research had previously been done, and found very few answers. "The only reference I found to motion in attracting pollinators says it's unlikely to be important, because insects are not good at detecting movement; which is clearly rubbish." To find out more, Dr Warren and colleague Penri James experimented with sea campion (Silene maritima) growing on an exposed coast within a Site of Special Scientific Interest in Cardigan Bay in west Wales. They observed 300 specially grown flowers of varying stem lengths, recording how much each flower moved in the wind, how often it was visited by insects and for how long, and how many seeds it went on to produce. Their experiments reveal that flowers mounted on long, thin stalks move around more in the wind. This acts as a powerful signal to passing pollinators, allowing the plant to attract more insects than less mobile flowers growing atop short, thick stems. "We found wavy flowers are more visible to insects, and thus attract more pollinators and set more seeds," said John Warren. But flowers ultimately face an evolutionary trade-off, he believes. "Short, fat-stalked flowers don't wobble enough and are less attractive to pollinators; yet very wobbly flowers are just too wobbly for the insects to handle, as the insects cannot land on them. "Only flowers that wobble the right amount are successful in setting seeds."